Reading and share top 12 famous quotes and sayings about Genuineness by famous authors and people. Browse top 12 famous quotes and sayings about Genuineness by most favorite authors. 1. "I'm afraid of losing my obscurity. Genuineness only thrives in the dark. Like celery." 2. 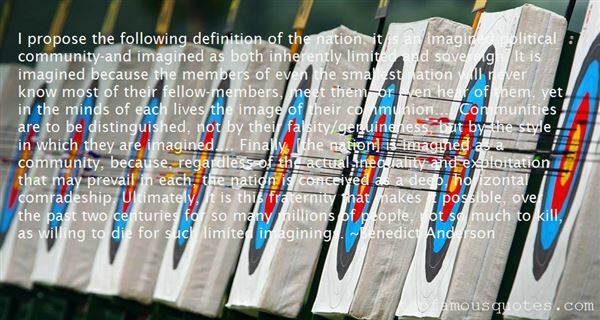 "The fellow members of even the smallese nation will never know most of their fellow members, meet them, or even hear of them, yet in the minds of each lives the image of the communion...Communities are to be distinguished, not by their falsity or genuineness, but in the style in which they are imagined." 3. "I propose the following definition of the nation: it is an imagined political community-and imagined as both inherently limited and sovereign. It is imagined because the members of even the smallest nation will never know most of their fellow-members, meet them, or even hear of them, yet in the minds of each lives the image of their communion.... Communities are to be distinguished, not by their falsity/genuineness, but by the style in which they are imagined.... Finally, [the nation] is imagined as a community, because, regardless of the actual inequality and exploitation that may prevail in each, the nation is conceived as a deep, horizontal comradeship. Ultimately, it is this fraternity that makes it possible, over the past two centuries for so many millions of people, not so much to kill, as willing to die for such limited imaginings." 4. "If you are a warrior, decency means that you are not cheating anybody at all. You are not even about to cheat anybody. There is a sense of straightforwardness and simplicity. With setting-sun vision, or vision based on cowardice, straightforwardness is always a problem. If people have some story or news to tell somebody else, first of all they are either excited or disappointed. Then they begin to figure out how to tell their news. They develop a plan, which leads them completely away from simply telling it. By the time a person hears the news, it is not news at all, but opinion. It becomes a message of some kind, rather than fresh, straightforward news. Decency is the absence of strategy. It is of utmost importance to realize that the warrior's approach should be simple-minded sometimes, very simple and straightforward. That makes it very beautiful: you having nothing up your sleeve; therefore a sense of genuineness comes through. That is decency." 5. "Go to Mozambique! As long as you don't expect to find flawless infrastructure, just go. Because this is a country where people have not quite grown accustomed to tourists. You still feel a genuineness that no longer exists in countries where tourism has been industrially developed." 6. "What war did for him (hasten disillusionment with communism), childbirth did for me. I began to notice what neglected, neurotic waifs the children of Communists were and to question the genuineness of the love of mankind that didn't begin at home." 7. 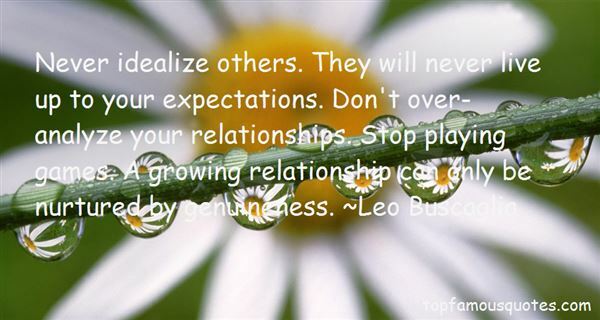 "Never idealize others. They will never live up to your expectations. Don't over-analyze your relationships. Stop playing games. A growing relationship can only be nurtured by genuineness." 8. "A mighty porterhouse steak an inch and a half thick, hot and sputtering from the griddle; dusted with fragrant pepper; enriched with little melting bits of butter of the most impeachable freshness and genuineness; the precious juices of the meat trickling out and joining the gravy, archipelagoed with mushrooms; a township or two of tender, yellowish fat gracing an out-lying district of this ample county of beefsteak; the long white bone which divides the sirloin from the tenderloin still in its place." 9. "I am glad I am rooted to the world of genuineness and simplicity It couldn't be taught in school or college it comes from my very special mum." 10. "And as soon as you accepted that the man's breakdown was a consequence of his war experience rather than his own innate weakness, then inevitably the war became the issue. 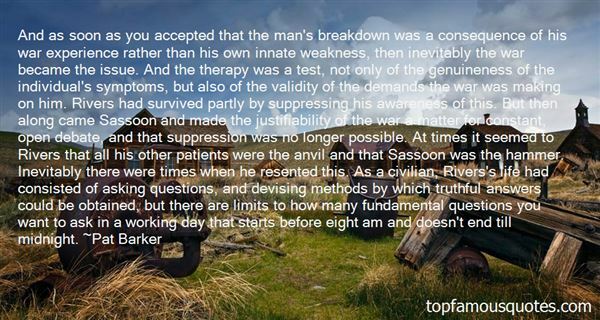 And the therapy was a test, not only of the genuineness of the individual's symptoms, but also of the validity of the demands the war was making on him. Rivers had survived partly by suppressing his awareness of this. But then along came Sassoon and made the justifiability of the war a matter for constant, open debate, and that suppression was no longer possible. At times it seemed to Rivers that all his other patients were the anvil and that Sassoon was the hammer. Inevitably there were times when he resented this. As a civilian, Rivers's life had consisted of asking questions, and devising methods by which truthful answers could be obtained, but there are limits to how many fundamental questions you want to ask in a working day that starts before eight am and doesn't end till midnight." 11. "Creative people, especially those who are just starting out, feel that they have to conform and be a mass-produced product in order to be noticed. The truth of the matter is that genuineness and unconventionality is often what helps make a mark on the world." 12. "The form and color which guide men experienced in the study of the masters are not always recognized by laymen. Yet they can feel the genuineness of an artist's response to the life they know." And he who is forever talking about enemies / Is himself the enemy!"